Comedy Magic and variety for all ages. Don't settle for less 36 yrs in business and still growing. 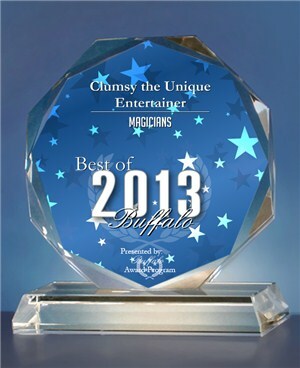 Awarded best of Buffalo Magician 2011, 2012, 2013, 2014, 2015 & 2016. Nickelodeon Best Party Entertainer Nominee 2009. My high energy performances include Juggling,comedy Escapology, Age appropriate Magic and Slapstick Comedy which keeps the audience laughing from start to finish! I can also stilt walk. Paul was great, more then expected. The kids loved his show, as did the parents, he kept us laughing throughout the show, The magic he did was awesome. Thanks for the show. 6-Year Old Birthday Party - Huge Success !!! We booked Paul for our daughter's 6th birthday party in Rochester. First off, he's a consummate professional. He arrived early to the party, which was a relief. His show is absolutely perfect. He had two audiences completely engaged for a full hour. One audience was ~20 six year olds and the other was a dozen adults. Both were completely transfixed. I wouldn't hesitate for a second to recommend Paul for anyone's party or event. He can cater to any age/audience and is a total professional. Paul, aka Clumsy, was fantastic! All the kids, as well as the adults in attendance, loved Paul's act. He was funny, engaging, and did some very cool magic tricks. He kept about 20 kids ages 5-8 laughing non-stop and totally engaged in what Paul was doing for an hour! Highly recommended!!! We wanted an entertainer that could keep the kids quiet when we had our speeches and awards, Paul didn't do this. He had kids laughing, interacting with him, shouting back answers and mesmerizing them with his magic. More importantly the kids were having a great time. We could hear them from the other room, and everyone had peace and comfort knowing that their kids were having a great time. It was the talk of the next day. We wouldn't of wanted it any other way. Paul did a great job with the kids, and was very professional in communication with me, setup was easy and painless even while 50 kids were running around. 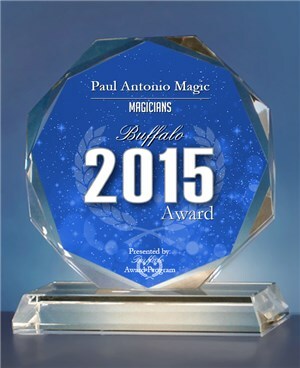 Overall we were extremely happy with Paul, and would recommend Paul for any event. Clumsy thoroughly entertained a houseful of kids for our Halloween party! We all had a great time! Great show, very entertaining and comical. Did a great job incorprating the audience into his show. Would definitely hire again! Clumsy Entertainer was wonderful. His humor and antics were clean, fun and enjoyable for every age! He is fast moving and talented! 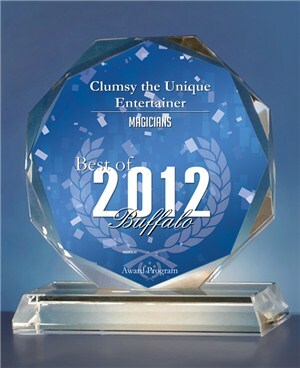 Clumsy was fantastic! We have special needs children in our facility and he was completely accomodating. He treated them just like any other normal child, and made them feel included in his show. He was really funny too. He even had all of the adults laughing! Clumsy has definitely practiced at what he does! Juggling three pins under his leg while riding a unicycle is definitely not something you can learn over night! For his skill level and expertise the pricing was above reasonable! I will definitely be looking to hire him again in the future. It was a pleasure to have him come visit us!! I booked Clumsy for my 5 year old grandson jake's birthday party, and he was just not what I expected, he not only kept all of the kids at the wdge of thier seats, but he had all of the adults in stitches the whole time. He was the best i have ever seen, and he is absolutely the sweetest person, he is local to town of tonawanda too. I beg you to try him he will make youre whole event perfect.Im already getting requests from all of our guests to have him again next year, and they all want to book him as well. I think it was the best thing we have ever done to find him.He surpassed everyones expectations!!!!!! go clumsy we love you!!!! sincerely michelle ridley. We had Clumsy for my 9 year olds birthday party. He kept 16 girls entertained for 1 hour and they laughed like crazy. I would strongly recommend Clumsy for any kind of kids party. He really knows understands his crowd and adapts his show to give all a good time. Thanks Clumsy. We booked Clumsy for our Medieval Feast for Shakespeare In Delaware Park. Clumsy tailored his act around a medieval theme to help bring the entire night together. He was fantastic at interacting with our guests during his stilt walking session at the beginning of the night and was amazing during his 15 minute performance including fire and sword juggling. We had clumsy for a birthday party with about 25 very active children. Ages 2-6.. He kept all the kids so engaged and had so much fun. They loved it and it really made the party great. He was prompt and on time and exceeded our expectations. Great job! I own a campground in Western New York and every year we hold a birthday party for all of our guests during the month of August. We were looking for an entertainer but we were well aware of the fear that many children have for "clowns". Clumsy the Entertainer is a perfect fit due to the lack of face paint used by British clowns. Our first booking was three years ago and we have had him here every year since. His show is entertaining and he is enjoyed by both the young and old. His workshop is a big hit with the older teens that are intrigued by his talent at juggling, uni-cycling and stilt walking. Give him a call and book him for your next party or event, you won't be disappointed. Five stars all the way! I saw Clumsy first at my son's school and was amazed at his expertise and professionalism, while thoroughly entertaining the audience ! I inquired re coming out to our end-of-year celebration for our Church School. He agreed. The price is definitely right for what you get, by the way ! He was fabulous ! Young and old watched him in awe !!! We loved his show so much we just booked him for this May again ! We are soo looking forward to seeing him again ! If you haven't seen Clumsy yet, you don't know what you are missing !!! Clumsy the Entertainer was excellent at our New Year's Eve Family Night event! The children and parents enjoyed his performances and participated well throughout the event! He is very professional, entertaining, kid friendly, and has great enegery. He was a pleasure to work with! Clumsy was prompt, unobtrusive while setting up his equipment. He engaged the audience, especially incorporating the children into his act. Yet, he used humor which was above the childrens' understanding, thereby including the adults in the performance. He was easy to contact and to negotiate the necesary business. We were pleased and would recommend him to others. Sound sytem and Lighting are used where required. I am 100% self contained. My Family stage performance is extremely fast paced, it involves magic to music in the beginning, followed by slapstick comedy. Audience participation follows when a number of children come and help with various props. The ever loved unicycle routine comes next, and boy does that get the kids excited and shouting at me!! Where do 5 year olds learn how to ride unicycles anyway ??? Juggling is added just to show off a few great tricks. The Finale of the performance is when I take a child from the audience and using the theme from Disney aladdin I make the child Float about 3 feet in the air. 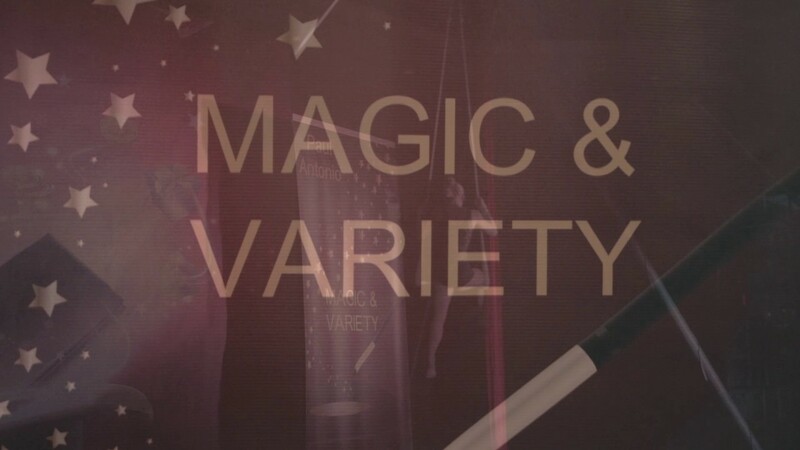 This is also a full variety show, I usually perform as Paul Antonio, wearing slightly different stagewear, I perform a number of stunts including completely mind boggling magic, various comedy routines, a straight jacket escape and of course my famous unicycle and juggling routine. This act is geared towards older and mature audiences however the humor is still 100% good CLEAN FUN. This is used for larger events and festivals, I bring my stilts which puts me high over the crowd and can be seen from a distance, I also incorporate juggling various items and can offer unicycling and fire juggling / fire eating where required (fire extinguisher is brought and an area is usually roped off for additonal safety). I am fully insured but dont panic no claims to date! Every event is confirmed in writing and I guarantee a fun filled performance, it doesnt matter if you are booking me for a large corporation, or for a small private event I will always bring the best show to suit the occasion and I always give 100%. My Calendar fills fast dont delay book your event today! I offer a wide variety of skills which I have learned over 30 years, performing since I was nine years old I have definately come to find what works best for my target audience! My high energy performances include Juggling, Unicycling, Age appropriate Magic and Slapstick Comedy which keeps the audience laughing from start to finish! My act is unique, fun and everyone participates. Included in the family show is a levitation illusion where a child will float about 3 feet in the air. I set up a backdrop and sound system to give a better atmosphere. This performance is usually 1 hour in length. Go Green a performance showing importance of helping the environment. Just Say No To Drugs - This performance gives a poitive message to students on ways drugs can effect us and our families. Every child can be a hero - this is a great feel good program geared toward community and helping others. Fun Fun Fun - great for the end of year or as a reward for students getting good grades. We my website for full details. Adult performances are about 45 minutes in length the magic is more sophisticated, The show has a number of volunteers assisting from the audience and includes a staight jacket escape. I use choreographed music with some effects, I set up a 12 foot backdrop, large banners and I even bring lighting for use in venues that dont have a stage. My stagewear is appropriate for a mature/adult audience and changes depending on the type of event. I guarantee the laughter will be heard from start to finish! If you are planning a large event or festival I offer Stilt Walking And Walkabout entertainment which I can perform from 1 hr to 8 hours for all day events. Bose PA system with wireless microphone for larger events. I bring a full portable backdrop to all performances it can be as short as 6 feet or as long as 12 feet. My sound system for music is all battery so no need to plug in however if there is a socket nearby I will use it. For larger events which require voice amplification I have my personal Shure radio mic which needs to be powered by electricity. If you have a socket to the right of the stage that is always a bonus! I loved Laurel and hardy, I also used to watch Harold Lloyd, a great British comedian Tommy cooper, and of course Charlie chaplin. Did i mention I started performing when I was 9.